Norwegian Cruise Line (Norwegian), a leading cruise brand of Norwegian Cruise Line Holdings together with Alipay, the world’s largest online and mobile payment platform operated by Ant Financial Services Group, today announced the debut of the Alipay payment solution on board Norwegian’s most recent addition to its fleet and its first in the China market, Norwegian Joy. This is a pioneering move where a major cruise operator has debuted a cruise ship with Alipay as part of its payment platform from the very beginning of operations. It also demonstrates Norwegian’s commitment to providing guests in China with offerings geared to their specific needs and tastes. With more than 450 million users, Alipay is China, and the world’s, leading online and mobile payment platform, one that significantly enhances the payment platform lineup on Norwegian Joy. Norwegian began accepting transactions on the Alipay platform on a trial basis beginning on a special preview cruise for members and guests of Alibaba Group (Alibaba) which departed from Shanghai on June 10. Including the Alipay payment solution on board Norwegian Joy is another step in a partnership announced earlier this year between Alibaba and Norwegian’s parent company, Norwegian Cruise Line Holdings (NASDAQ: NCLH) – a partnership which combines Norwegian’s experience in providing unforgettable vacations with Alibaba’s insights into Chinese consumers to offer a cruise product tailor-made for Chinese guests. “When designing Norwegian Joy, our goal was to construct a ship that would deliver a First Class at Sea experience while making Chinese guests still feel at home,” said David Herrera, President of NCLH China. 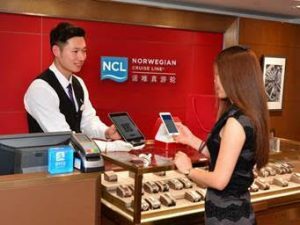 “Providing the Alipay payment solution to our guests allows our guests to make purchases with the most-used payment system in China at the several luxury shops, dining venues with multinational cuisine and other points of purchase on Norwegian Joy in the same way that they use it on land. The great success of our trial on our June 10 preview voyage has allowed us to make this mobile payment method available to all guests much sooner than originally planned. I’d like to thank the team at Alipay who worked hand in hand with the team at Norwegian to make this possible. I am extremely proud of what we have accomplished together,” continued Herrera. Norwegian Joy will sail a series of preview cruises during the month of June, with the ship’s christening ceremony taking place on June 27 in Shanghai, featuring the ship’s Godfather, ‘King of Chinese Pop,’ Wang Leehom. Year-round voyages on Norwegian Joy from Shanghai begin on June 28 with a season of sailings departing from Tianjin from August 26 to September 15.